To err is human; therefore, one of the most important skills we can develop is course correction. It’s crucial to recognize when a mistake is a mistake . . . and then to change course and move forward a better person. Or to move forward a better school system. As school leaders this is often a place where we fall down. We purchase and implement a program or textbook series or we create and hire a new position to solve a problem and then we walk away. That seldom works. Once we implement, we have to continue to listen, to pay attention, to follow through and to course correct where needed. The hardest part is finding a balance between where to set non-negotiables (systemic expectations) and where to allow for course correction. Here’s an example of the course correction needed here at SGI with the implementation and convergence of two different plans with two different, but similar, technology solutions. First we have our Response to Intervention (RTI) Plan. The purpose of this plan is to use a valid, reliable diagnostic tool for early identification and then support of students potentially in need of intervention in grades K-5. A dedicated team of teachers and administrators worked with our Director of Special Education, Shelly Sarikey and Dr. Lisa Kilanowski, an associate professor of psychology at Niagara University to develop our RTI Plan. They outlined the goals, identified a benchmark assessment and detailed the progress monitoring and program specifics of each tier of intervention. Second we have our Academic Intervention Services (AIS) Plan. The purpose of this plan is to combine a valid and reliable growth measure and individualized instruction for every student grades K-6. Implemented during the Intervention Block (IB) that all K-6 students have every day, this personalized learning path is developed for all learners. The adaptive testing and diagnostic instruction helps us meet the unique needs of each individual student. Coupled with the fluid ability groups designed in our AIS Plan, teachers are able to focus on the needs of a smaller group during IB, also challenging our most advanced students. As we implemented both of these plans, we assumed they would run concurrently and we would be sure to meet the needs of all of our students. What we found was a complicated set of circumstances including a diagnostic tool for the RTI plan that was new and just didn’t work well. I’m forever grateful for the ways in which our Administrative Team has continued to pay attention, listen to our teachers and parents and then to course correct. What does course correction look like in this case? Lots of listening to everyone involved and plenty of face to face discussions that led us to say, “why can’t we use this one valid and reliable diagnostic tool to satisfy the goals of both plans?” It requires changes to the RTI Plan, but not in the area of intent or goals, just in the area of the assessment tool and progress monitoring. Our specialized RTI teachers can still do what they’ve always done–use a multitude of strategies and materials to work with small groups of students to intervene and differentiate instruction for every student. At the same time, the tool they’ll use to progress monitor their students is aligned with what the classroom teachers are using and they have access to the same individualized diagnostic instruction. It’s one thing to have a great plan on paper. It’s another thing to implement a plan successfully. It’s critical to “administer” the plan and to make changes as needed. It may be messy while we figure it out, but it’s worth it. Thank you to our entire SGI team for working through the implementation of two new plans intended to help our students succeed in our schools. For additional assistance or information on voter eligibility, voter registration, or absentee ballots, contact the District Clerk at 592-3230 or via email at ktucker@springvillegi.org. You may vote on September 27, 2016 without pre-registration if you are a registered voter with the school district. You are a registered voter with the school district if you have voted in at least one school vote since January 1, 2012. You are also eligible to vote if you are a registered voter with the Erie or Cattaraugus counties Boards of Election and meet the residency requirements. You must vote at the polling location you are assigned to, which is based upon the location of your residence and which voting district your residence is part of. A map of voting districts is available on the district website. • a resident within the District for a period of thirty (30) days prior to the meeting at which he/she offers to vote. Please bring photo I.D. that verifies your age and residence (i.e. driver’s license). If you are unable to appear to vote in person on the day of the school district capital project vote, you may request an Application for Absentee Ballot from the District Clerk or download a copy from the District web site. Once your completed and signed application is received by the District Clerk and veri-fied that the claimant is entitled to vote, ballots will be mailed to the applicant(s). Please note that Applications for Absentee Ballots must be received by the District Clerk at least 7 days before the vote (by Tuesday, September 20) if the ballot is to be mailed to the voter, or the day be-fore the vote (September 26) if the ballot is to be delivered personally to the voter. Here are some Frequently Asked Questions and Answers on the Capital Project. Q. Why do we need this Capital Project? A. Last year, an engineering and architectural evaluation was conducted on the condition of the school facilities. This evaluation identified and prioritized several issues primarily related to health and safety, preservation of buildings, energy efficiency and site improvements. The Board is now proposing to address those facilities necessities identified in the most cost efficient manner — a Capital Project — where the District can take advantage of obtaining State Building Aid to offset construction costs that would otherwise be funded by the local taxpayers. Q. What has changed from the last project vote that was held in December 2015? A. In December 2015, a $38.7 million project was defeated by the community. Since that time, the District has solicited feedback from voters and community representatives to gather the public’s opinions on the scope of the project and where the District could improve. That input was very seriously considered and has caused the District to re-evaluate its needs vs. wants. Now, the Board of Education has approved a narrowed scope of work and a project based primarily on #1 priorities and critical needs. The new Capital Project has been reduced to $27,795,000. Q. Why come back to the voters so soon? A. Much of the project’s scope includes critical items that have reached the end of their useful life, such as roofs, heating/ventilating units, pavement, flooring, etc. The District couldn’t afford to wait. We have to address these items in the most cost-effective way possible — through a capital project — where the State will support the District with 70% of the construction in Building Aid. Q. What if the vote doesn’t pass? A. A capital project assures that the District will receive their share of State Building Aid for capital improvements. If the vote does not pass, the critical work would then have to be paid for through the school district’s general fund, with 100% of the associated costs passed on to local taxpayers. Payment of the construction would also have to be made immediately instead of spreading the costs out over a number of years. Q. When will the work take place? A. After final design and the State Education Department’s approvals, it is anticipated that construction would start in 2018 with substantial completion in late 2019. Q. Where can I get more information regarding the project? A. The District has scheduled a public hearing for Tuesday, September 20. There will be a capital project presentation and an open forum for questions. The district newsletter, The Bulletin, included pages 9-12 on the capital project. In addition, information can be found on the District’s website (www.springvillegi.org) and social media outlets. Please also feel free to visit Superintendent Kimberly Moritz’ blog at www.kimberlymoritz.com. On Tuesday, September 27, 2016, you will have an opportunity to vote on a capital project that is designed to address critical facilities work in each of our buildings. The project items come directly from a needs assessment that the State Education Department requires our District complete every five years to be sure we are planning for and maintaining the district’s assets. We presented most of the work detailed in a capital project newsletter last December. However, that project included $12 million of additional work, including a significant addition to the high school to house a new gymnasium. We received a lot of constructive feedback when that project was voted down. Over the past several months we have continued to listen, meeting with various representatives from the community. Based on your input and much planning we are proposing a project that is much more narrow in scope and focuses on our critical needs. This project includes the replacement of many items home and business owners will understand are a part of maintaining a property: rooftops, heating and ventilation units, pavement, curbing and sidewalks, updated fire alarm systems, and flooring. We also must replace our track surface and are therefore expanding the track to a full 8 lane track, an improvement that’s smart to do now. This project does NOT include a new HS gym, office relocations, renovation of the existing media center, or replacement of the athletic field lighting system. There is more work to be done in our schools, there always will be—that’s part of the responsibility of owning and maintaining school buildings. We have been extremely cognizant of the cost to the taxpayer of the work we’ve included in this project scope. All work will be paid for using a combination of state aid funding, cash from the capital project reserve established by our taxpayers, and the local tax share. The amount of this project that is eligible for state aid has been maximized and our current debt from previous projects has been carefully considered to result in a proposed project of $27,795,000, including $1,301,000 in capitalized interest. This means, for example, that for a $100,000 “full/equalized value” home, a resident with Senior/STAR would pay an additional $7 per year, a primary resident with STAR would pay $13 per year, and a non-STAR resident would pay $19 per year. 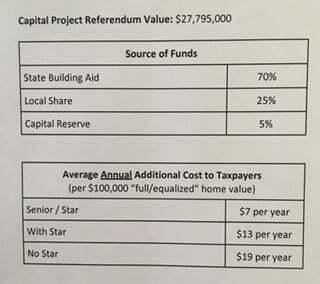 By contrast, the $38,772,000 project presented and defeated by the voters in December 2015 would have cost the same taxpayer up to an additional $47.87 annually. The December 2015 Project did not include the capitalized interest we’ve included for this project, therefore we’ve reduced the scope of work from the December project by $12,278,000. We know how much pride this community has in SGI. Capital projects like this one help to keep our facilities in good working order and improve the conditions under which our children learn and thrive. We need and appreciate your support. We encourage you to learn more at the Public Hearing on September 20 and to vote on September 27, 2016. We need our state senators and assembly members to support fully funding UPK in every district in ways commensurate with the rest of our K-12 school system. What’s it called when everyone in a system agrees about something and yet nothing seems to change or is done about it? In public education, an example of this problem is Universal Pre-Kindergarten (UPK) funding. Universal Pre–K is a movement within the American education system to make access to preschool education available to all families, similar to the way kindergarten is available to all 5- and 6-year-olds. Except it’s not universal or available to all families. Most districts who offer UPK have a lottery system in which they randomly pull names of children within the district up to the number of spots provided for in the grant funding the individual district has applied for and received. Then the families who are lucky enough to be awarded the spots have to be able to get the child to and from the half day UPK and figure out child care for the other half of the day. If I’m a working mom out of the district, how do I make that work? We send out letters to sixty families every year that tell them that their child has been awarded a spot in our UPK program that is run through a private provider in Springville, the Early Bird ChildCare Center. Pat Marcello, along with her daughter Colleen, have done a wonderful job of providing both UPK and child care services to the families of Springville since 1975. Even if you’re not in education a simple google search “Does early intervention make a difference?” will result in 109,000,000 links to articles supporting early childhood education. The research is abundant and rich. We KNOW, we have ALWAYS known, that early childhood education makes a huge difference in the lives of our children. I would argue it can be the most significant year of a child’s formal school life in which we can make enormous gains in learning and capacity that will impact the child for life. The accomplishment of which I am most proud in my career as a school leader is the implementation of full day UPK in Randolph for our neediest students. All I did was say “yes” to Dr. Mary Rockey when she asked if she could start a SCIS (special class in an integrated setting) pre-kindergarten classroom for the children of that district. Mary rightfully advocated that bringing in our neediest children and connecting them to our providers at an earlier age would help us make important gains at a crucial time in brain development. That small rural school district now supports two SCIS classrooms and UPK half day for the other families who choose to participate. The growth I personally saw children make, through early intervention, was one of the most rewarding experiences of my career. And I did nothing as a leader but say yes to an administrator with an idea. Because it’s a special education program, the funding was rich and the local share was supported by the Randolph BOE members who also saw the importance of early intervention. And yet we still have a competitive grant structure that leads to inadequate and uneven funding gained IF a school district has someone equipped at filing for a competitive grant OR wants to pay an outside entity to do so AND which grant funding they go after AND if they meet the criteria for the award. We need our state senators and assembly members to support fully funding UPK in every district as they fund the rest of our K-12 school systems. Governor Cuomo heralds how much he’s done to support UPK to great applause in his state of the state address each year. I wonder if it’s actually a great way for Governor Cuomo to over-estimate his expenditures, saying that he’s dedicating a huge amount of money to UPK that doesn’t end up being awarded. I don’t pretend to understand his reasons for heralding the importance of UPK and then continuing an unfair, uneven and inequitable means of funding it. We also need local districts to make decisions when budgeting to support early intervention through full day true UNIVERSAL pre-kindergarten for every family who chooses to send their children to our programs and we need to provide transportation. We have to push for fully funded UPK for all 4 year olds. How do we not when we know that this is perhaps the most critical year in a child’s learning? Every year we employ preferred “building” substitute teachers. A preferred building substitute teacher teaches on a daily, itinerant basis when students are in attendance. What a great opportunity for someone who’s recently graduated or hasn’t yet obtained a teaching position! If you are a NYSED certified teacher and would be interested in a position in which you substitute every day in one of our buildings (the same building every day), please submit your application to the Personnel Clerk, SGI CSD, 307 Newman Street, Springville, New York 14141. Complete the application for instructional personnel, available under the Employment Opportunities link at www.springvillegi.org. The salary is $110 per day for our preferred building subs which is higher than our daily substitute certified teacher rate of $95/$90 daily substitute non-certified teacher substitute rate. Applications are due as soon as possible and we will work to have our preferred building substitutes identified for BOE consideration at the Monday, September 12 BOE meeting. We accept regular substitute applications for all positions throughout the school year. Please consider applying to substitute at SGI! Springville-Griffith Institute Central School District is an equal opportunity employer.